Initially, the RT step should be performed as specified in the supplier protocol. However, the length and the temperature of the RT step can be optimized to increase the efficiency of the reverse transcriptase. The reverse transcriptase should be tested across a range of RNA concentrations to ensure assay linearity. An RNase free environment is essential when working with RNA samples. Obtaining full-length, high-quality RNA can be a real challenge in the lab. The structure and lability of RNA, and the fact that enzymes that degrade RNA are ubiquitous, hardy, and nearly impossible to remove can make working with RNA difficult. Even trace amounts of RNase can degrade RNA, so it is essential to avoid inadvertently introducing RNase into RNA samples during or after the isolation procedure. To help you ensure the best possible results when working with RNA, we've published some key hints and tips for working with RNA samples. The article explores the main reasons for RNA degradation and discusses the various sources of RNases such as skin, dust, reagents and the samples themselves. 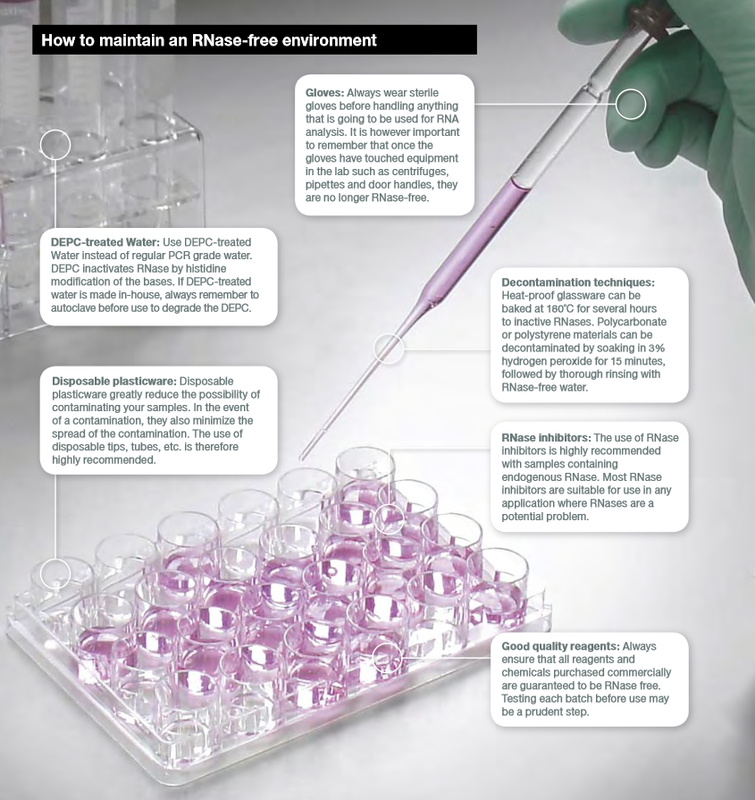 It also includes suggestions on lab precautions you can take such as wearing gloves, using RNase inhibitors, and explains how high-quality reagents will help maintain an RNase-free environment.